A lot has changed since Cando was founded in 1978. We work inside a fast-moving global supply chain, ensuring gas is at the pumps, parts are at the automobile plant, lumber is at the sawmills and bread is on our tables. In Canada and the U.S., Cando Rail Services is at the heart of that global supply chain, helping our customers and their supply chain networks run faster and more smoothly. Our new website tells that story. It talks about what we do in a new, more comprehensive way. The new site delves into the industries we serve and the services we provide, but it also features a newsroom where we can do so much more. It’s there where we can tell the stories of how Cando speeds up and enhances the supply chain of companies as they move materials, goods and resources across the continent. Our company has grown from dismantling regional railways nearly 40 years ago, to being a leader in the rail services business in North America. We’ve grown because we’ve always been ready and willing to change with the times. Today that means we are a vital part of our customers’ operations. We help them plan and design their yards, service their equipment and run their rail operations. When they hire us, they know they’re getting rail experts who can help them boost safety, productivity and profits. 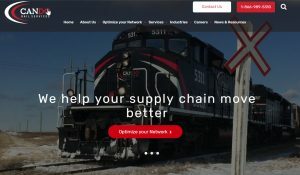 We are the linchpin that connects our customers to that gigantic global supply chain. We have rail expertise that most industries don’t have. In a world where governments are demanding transparency and higher degrees of safety for railways, most industries are looking to companies like ours to run first rate rail operations. Our new site will feature stories from those operations across our company – from moving truck frames, potash, pulp and paper or oil. We are rail experts and we plan to showcase that expertise over time. The site talks about how we help our customers do their jobs better. It will also give us an opportunity to highlight our focus on safety. Better than that though, it will help us communicate better to our customers and to the communities we serve. The new site will be a work in progress. We hope you’ll check back frequently. Meanwhile, you can receive periodic updates from us by subscribing to our email updates.